These board books present individual stories from the enormously popular BEGINNER'S BIBLE. The bold, engaging artwork and the simple text are pitched just right for pre-readers and those just starting to read. 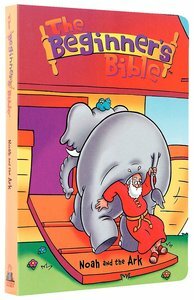 An ideal way to introduce children to God's Word. Ages 1-4. About "Noah and the Ark (Beginner's Bible Series)"
This title contains treasured stories using "The Beginner's Bible" artworknd simple words. It offers a perfect way to help the very young learn aboutimple morals and trusting God.